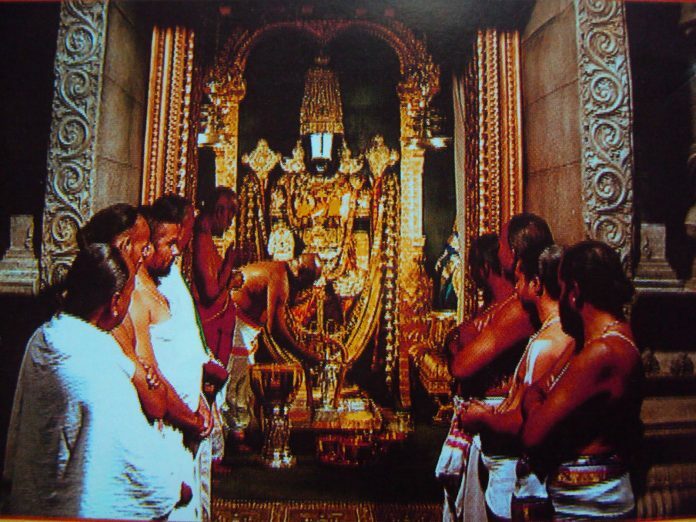 Tirumala: The Tirumala Tirupathi Devasthanam(TTD) management is releasing 54,421 tickets for Arjitha Seva online on May 5. The tickets are applicable from July and August of 2017. On this note, TTD EO Dr. D.Sambasiva Rao told that the figures of the number of pilgrims, annaprasadams, reception, etc. recorded in April this year are greater than the previous year. Approximately 23.15 lakhs people had darshan of Lord Venkateswara this April whereas the registered number in last year April is 20.49 lakh. The number of Prasadam Laddus sold are 87.45lakh and previous year is 77.45lakh. The annaprasadams recorded the number of pilgrims who were served food is 22.22 lakh this year and 20.36 lakh last year. 10.70 lakh pilgrims offered their hair in Kalyanakatta this year against the 9.98 lakh last year. The Hundi collections are also 1.35 crores more than the last year. The collections are 77.25 crores this April and 77.90 crores last year. Room occupancy is also higher than the last year considering the figures 109 pc this year and 104pc last year.